You are here: HomenextPlacesnextStreetsnextKensington GardensnextWhere and when? I found this photograph in my Brighton collection. But I can’t remember where it was taken and have no idea of the date. If you can help out – please leave a comment below. I think that the street is Kensington Gardens and that the shop, John Blundell Ltd., is today the large Bric-a-Brac shop whose name I can’t remember even though I walked past it this morning when I was in Brighton. It looks like Kensington Gardens to me. Can’t quite decide if we are looking at North Road in the background and turning into Kensington Gardens or if that is Church Street in the back and we have turned into Gardener’s Street? Long time since I walked those streets but fond memories of them all. As for the year, well, the Astrakhan (spelling??) coat in the foreground was probably ’50s-’60s and the little heeled shoes and fur trim collar to match would be the same. However the young man wearing what looks like a wet look coat would have been more early ’70s. The lady with the zip front jacket has fooled me further. Didn’t know we had such things back then. Come on….give us the answers someone, please! Sandra. The photo is of Kensington Gardens. Possibly taken in the early 1970s. John Blundell Ltd were a company that supplied goods on credit mainly at the customers home (usually the front door); their labour force were called ‘Tally Men’ and collected the money each week. Its Kensington Gardens without a doubt, but the year is much harder – I think its late 1970s or even very early 1980s! It is definitely Kensington Gardens! Possibly late ’60s early ’70s. Definitely Kensington Gardens, probably late ’60s – early ’70s. I can remember walking through this street in the ’50s as a schoolboy, can’t remember the name for the life of me, but the lack of women wearing trousers or trouser suites makes me think this is the ’50s or early ’60s. I think that the road in the distance is North Road. Yes, it is Kensington Gardens. I used to walk through it every day on my way to school…way back! I also think this is Kensington Gardens, Brighton, looking south towards North Road (which rises from east to west – left to right in this photo). It’s definitely Kensington Gardens. I would guess ’60s-’70s. I remember my mum buying wallpaper in Blundells when I was a kid. Kensington Gardens looking south, halfway along; the Blundell shop is now Snooper’s Paradise.The final Kelly’s Directory is 1974 and that shows all the named premises visible in the image, so it is somewhere around that date. What a contrast with the present! This shows a working class district with ‘sensible’ goods for sale…in contrast to the fascinating but largely non-essential stuff on sale today. Most definitely Kensington Gardens – looking towards North Road. Probably late 196’s – early 1970s? Blundells was opposite my dad’s shop: Kensington Furniture or Parke’s as it was originally called and they were at 26-29 Kensington Gardens. They were wonderful shops and Dad said there were cottages underneath, I was too scared to go into the basement area. Yes, you are quite right, Blundells was a tally man’s shop! What a blast from the past! Definitely Kensington Gardens. My mum shopped there regularly. Definitely Kensington Gardens. Hard to date, I’d say early 60s judging by the clothes. This is Kensington Gardens in the mid ’60s. The PVC mac of the man to the right is a giveaway! That sort of mac was in fashion at the beginning of the mod era. 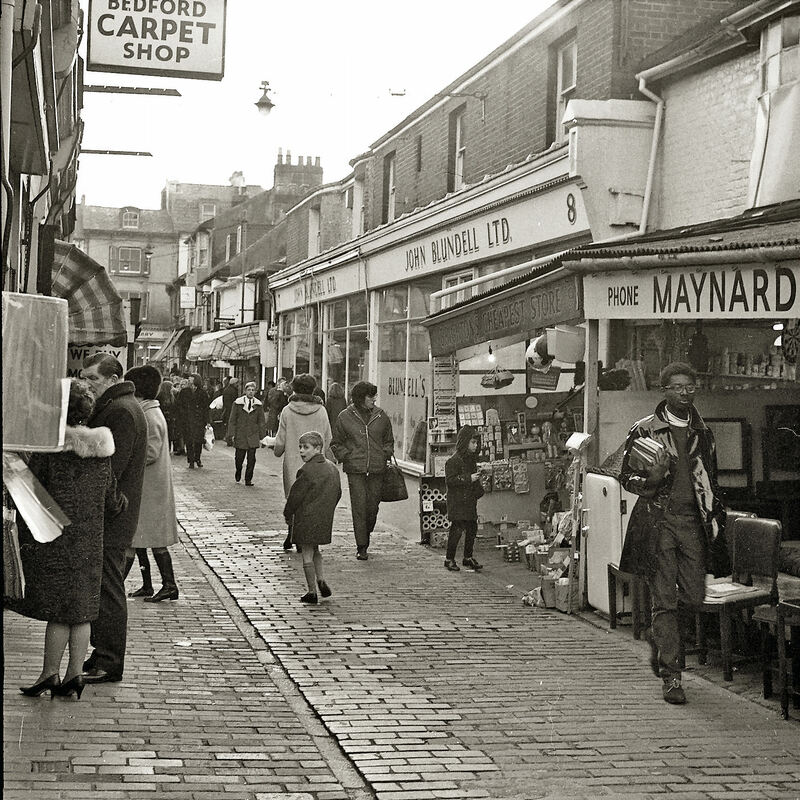 What no one has mentioned is that to the left and ‘behind’ the photographer was the site of the first Body Shop. It was a tiny place and bottles of various ungents were filled from larger bottles. The rest is history. Yes! Kensington Gardens. I worked at Blundells in 1958. Maynards first appears in the directory in 1968. The identifiable shops were all still there in 1973. My mother, Jean Lawrence worked in the accounts dept at Blundells in the early seventies. I think I remember going to see her there as a kid. Kensington Gardens, I used to work at Blundells. My Dad Bert Stenning worked as a tally man and was made Manager of Blundells. He left in about in about 1965. I work at Blundell when I left school in 63. I loved that job in the office, made so many friends there, and had so many laughs. We used to add up the accounts books on the adding machine, and hoped they tallied up. All the collectors – tally men, as people call them – used to pass their ledgers through the hatches. We were so young only 15 years old and we worked five half day week for 3 pounds 10 shillings. My mum had half nearly, loved it there though. I remember your dad Bert Stenning, a very nice man.